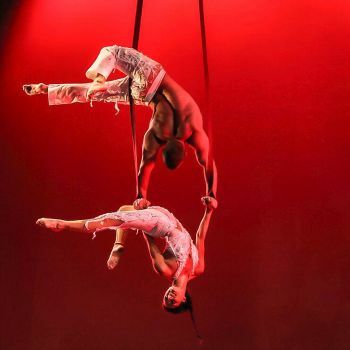 Omri and Paulina are an aerial duo that specialize in duo straps and aerial acts that combine a high level of technicality and strength with emotion, storytelling, and compelling chemistry. They strive not only to amaze and inspire, but also speak to the soul of their audience. Omri is a former international bobsled driver and competed in international competition for 7 years before discovering aerial. He has also worked as an animal trainer for animals ranging from dogs to killer whales. He Is also a former competitive gymnast and nationally ranked swimmer. He discovered aerial arts and developed a skill set based in high-level strength and dynamic to static precision.